Empire Today - We dont need your money. Aug 14, 2010 I have read your post and as a member of the Customer Service Management Team, I truly do apologize that we did not make our installation appointment with you and any inconvenience that this may have caused. 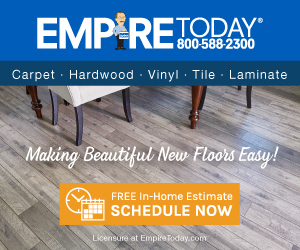 Every appointment that is made with Empire is extremely important to us. If possible, I would like if you could contact me at customersupport@empiretoday.com or via phone at888-588-2315 x4195. - Rebekah Clerk, National Customer Service Manager As part of our process we call customers on the morning of their schedule installation appointment to confirm a 2-hour window of time for the professional installers to arrive. I am sorry for the inconvenience this experience caused you and understand that it was frustrating for you to move your furniture. Customer satisfaction is very important to Empire and we want to work with you to make things right. had appointment for carpet installation on 3-17-2010. moved furniture outside for installation. took 2 hours. nobody showed up. called customer service and they could not find my order. waited till 3;30 with no call. will never do business with empire. now i need to move furniture back in. I guess my $5,000 dollars was not enough to warrant an apology. i bet home depot or any other carpet store would love to have my money. Review #159415 is a subjective opinion of User159415. really....top dollar for so-so carpet. well any company will take ur money but haw fast will they return it. Y r people soooooo trusting, u would literally let a stranger in ur home. SHAME ON U!!!! Thank you for bringing carpet experience to our attention. We apologize for any inconvenience, and our customer service team would like to work with you to explore a resolution. Please contact us at 800-588-2300 so we can assist you. scheduled an appointment with Empire. Sales person did not show up and when I tried to find out what was going on, all i could get was a series of people to tell me that they didn't know where he was or if he was going to show up.